You know your career isn't working. You're ready for a new direction. But what do you do? Where do you start? How do you get there? Attention Job Hoppers and Chronically Dissatisfied Workers: When you’re unhappy at work, everything in life gets harder. My name is Chrissy, and I know what you’re going through because I’ve been there. Early in my career, I was absolutely miserable. I dreaded Mondays; I actually wanted to get sick just to have an excuse not to go to work. My relationships with friends and family tanked. I was depressed and irritable all the time. I watched other people happily pursuing careers they loved, and I started to wonder if something was wrong with me. I knew I had so much potential, but I felt I had let everyone down—including myself. I’m guessing you can relate to at least some of my story… Of course, that was over 10 years ago now. These days, I know better than to blame myself for career misery. I also know there’s no reason to settle for that kind of life. In 2007, I found my nourishing career—one that truly enriches my life and brings me joy on a daily basis. Since then, I’ve experienced an entirely new way of living and working, and I know I never have to go back to those old Monday blues. Now, I get to guide others to experience the same career transformation. Your physical health suffers: you feel exhausted, gain weight, drink a little too much, etc. Your relationships get strained: no one understands your feelings but they all think they have the answers to your problem! There IS a career out there that is right for YOU. It’s never too late. 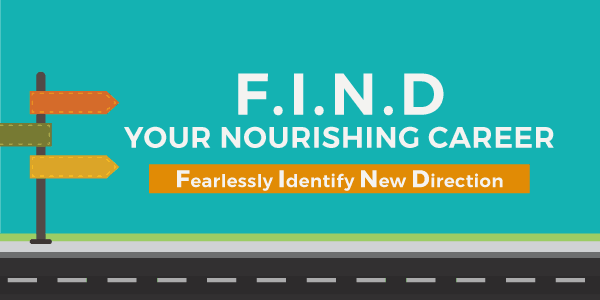 I’ve helped hundreds of people find their nourishing career and I want to do the same for you. If that concept it new for you, let me explain what I mean: A nourishing career is one that provides lasting fulfillment. It enhances every other piece of your life. These promises are not extravagant; they’re real. I’ve experienced it myself and seen it happen for my clients. If you’re sick of struggling and you’re ready to find the career that’s right for YOU, it’s time for a different approach. This program teaches you a realistic, systematic process for determining your next career move. WARNING: This program does NOT take a pie-in-the-sky approach. You will not be encouraged to “follow your dreams” without regard for the reality of what that means. 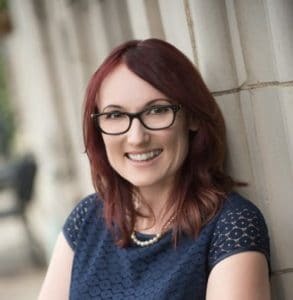 While making spontaneous leaps of faith in your career might sound exciting, my goal is to help you make smart moves that create lasting fulfillment. You have financial responsibilities, family obligations and other life circumstances you have to consider. You will be encouraged to explore with imagination and optimism, but you will also do your due diligence to make sure your decisions have a realistic chance of bringing you success. These videos are quick and to-the-point, and they’re available on-demand at your convenience. Watch them whenever you’d like, as many times as you’d like. Each lesson includes downloadable materials to help you apply what you’ve learned. These items walk you through activities, step-by-step, so you can see the pieces of the puzzle coming together. Create your personal Career Profile—a comprehensive document that defines exactly what you offer professionally and what you want /need from your career. 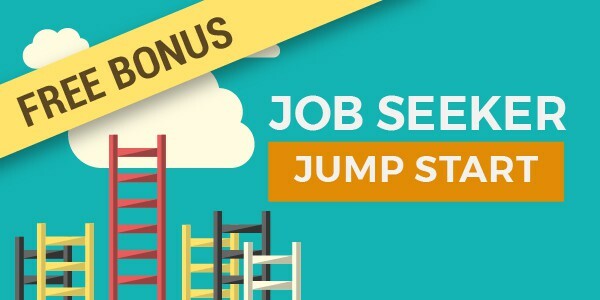 Sign up today and you’ll also get free access to the Job Seeker Jump Start program which includes everything you need to know about launching an effective job search, writing a winning resume and cover letter, acing your job interview, and more. Job Seeker Jump Start regularly sells for $97.00 but it’s yours for FREE when you sign up for the F.I.N.D. 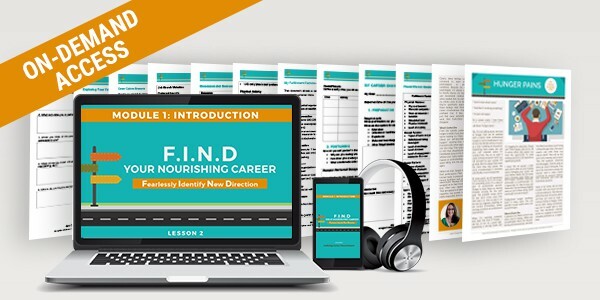 Your Nourishing Career Program. 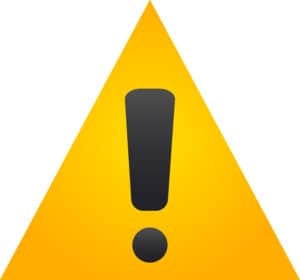 When you sign up, you will receive immediate access to ALL of the course materials. You can then work through the program at your own pace. You will be granted access to the videos for one full year from the date of purchase. The downloadable materials are yours to keep forever. When you sign up as a VIP, you will have access to my calendar. You can schedule your one-on-one session for me at any time. I recommend that you wait until you’re done with the program so we can review your work together and position you for faster success in your transition. All classes are pre-recorded and available immediately upon purchase, along with all of the downloadable materials and bonus materials. You can work through them at your own pace, as quickly as you’d like. You have access to the video training sessions for one year from the purchase date, but the downloadable materials are yours to keep forever. Yep! It’s fun and worth it. If you’re unhappy with your current career and you don’t know what career you really want to move in to, this program is for you. I can’t guarantee that you’ll be working in your new nourishing career within any certain period of time if that’s what you’re hoping for. That depends on you, your willingness to do the work, and a lot of things outside of my control. But I do guarantee that the course will show you how to determine your new career direction. I'm interested in self-employment. Will this program show me how to start my own business? No. This program is primarily geared for people interested in traditional employment. If you’re exploring self-employment as one of several options, this program will help you identify if that’s a good direction. But it won’t help you build a business plan or anything like that. I've never been happy at work. How do I know I ever can be? Even if you’ve never been happy at work before, you can be in the future. In a few rare cases, I’ve found that other personal circumstances may interfere with a person’s ability to really find nourishing work. But, if you’re a reasonably healthy and generally happy person under normal circumstances, I think it’s possible for you. I have had a hard time with career decisions in the past. Can you just tell me what to do? I will tell you how to make smart career decisions and help you gather all the information you need to do so, but I won’t make career decisions for you.